You know what highly success people advise? That you surround yourself with more successful people so that with the help of the group’s dynamics, you will also succeed. It makes perfect sense – when no one around you is aiming low, nothing- even you- can hold you back. So what does that have to be with beauty and fitness? Well, a lot actually. The idea is that you will hang out more often with friends who pay attention to how they look. I am not suggesting you surround yourself with superficial people, fashion victims or diet freaks. Rather, I am merely suggesting that among all the friends you can hang out with, choose to spend time with the ones who are more active, health-conscious and overall well-groomed. Because you will feel bad if you are the only one who’s not taking care of yourself, peer pressure and motivation will make you want to put on that little touch of make-up, give up on the coffee cream and pick your more flattering outfits to wear. Yes, this is a Lindy Hop move. Hopefully one day, it'll be possible for me too. But there is no way I am going to get to it if I just sit around with my friends who only like to sit around. I have a lot of those! 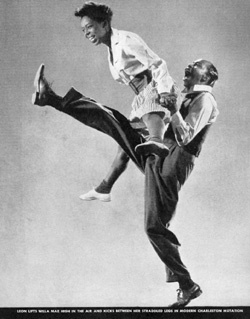 Recently, I have been spending more time at the dance studio (where I am taking lindy hop lessons). The more I watch the good dancers, the more I want to attend the practice times and well, the more I want to dance. And the more I dance, the better I feel . And the more moves I can master, the more I will enjoy it and the more I will want to dance. Oh, yes :it is one fantastic and beneficial cycle. The point is whatever you’d like to accomplish and/or maintain, find a way to hang out with people who are better at it than you do, or at least just as enthusiastic as you are. I had a great year in Norway, when I was an exchange student. I had great friends, who were just as addicted to fun and partying as I was. The result? One fantastic year. And I am thinking, why not apply it to our looks?